HTML5 Animations - attention-grabbing, eye-catching, but creating one is a task in itself. Usually creating animated graphics takes a lot of time and work, but with Animatron, you can get professional quality work without even writing a single line of code. Animatron is cloud-based software that allows you to create stunning HTML5 animations, banners and infographics for desktops as well as mobile devices. Import videos, pictures, fonts, etc. Want to see more of such animations? Click here. What you see is What you get. Design your animations visually, based on a timeline, so that you can relieve yourself from the pain of checking everything every time. Export to HTML5, SVG, GIF, and video. Create amazing artwork directly in your browser. Designed and built for newbies and professionals alike. No matter what your level of expertise is, you can work through it easily by checking out a few tutorials on their site. What can you do with videos in Animatron? Create stunning HTML5 animation video and make your own story. You need to register at the vendor website, for instant access to the plan you purchased for one year. Once the subscription expires, your plan will revert to the free plan automatically (unless you renew your subscription). Your existing projects will remain in your account and you can continue to edit them. your Pro private projects will continue to remain private. You can renew your subscription at the regular price, if you wish. Since both the plans are of 1 year, support will be provided for 1 year. 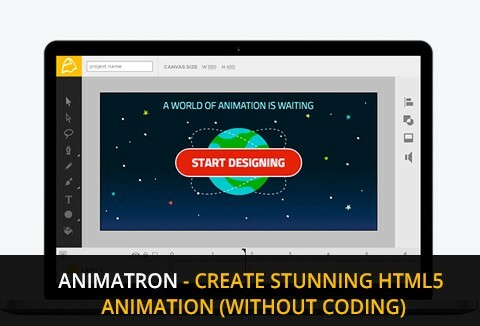 Ready to create stunning HTML5 animation with Animatron? This is a very awesome tool, its really easy to start creating your own animations. Thanks Dealfuel crew for deals like this. I simply love this ones!